Surprisingly, your cat’s purr-fect coat may be hiding skin allergies or diseases that may be more irritating to your cat than you are. Cats, like humans, can have allergic reactions to many things including food and items in the home. In addition to possible allergens in the house, cats can have allergic reactions to the environment. Allergens such as grass, weeds, pollen, mold and dust can cause allergy symptoms. 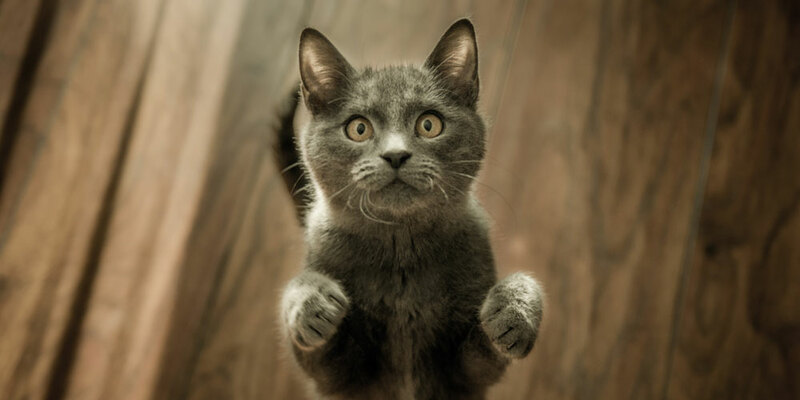 Other irritants such as smoke, perfume, and medication can also cause your kitty to itch. Fleas and ticks can sometimes cause an allergic reaction or more serious medical condition in cats as well. Also, keep an eye out for dry, flaky skin, and remember that cats with skin disease may not enjoy being pet since that may cause discomfort. As every cat lover knows, cats are able to get into every nook and cranny in the home; so finding the source of an allergy may be challenging. Cats can be more susceptible to allergies depending on the season and climate. This will obviously vary depending on what part of the country you live in. Be sure to consult a pet care professional if you believe you cat has allergies. Your veterinarian will also be able to conduct skin or blood tests to properly diagnose your cat. A more common source of a cat skin allergies is food. Your veterinarian can conduct skin and blood tests to rule out a food allergy. This may also require feeding a prescription diet or a hydrolyzed protein diet. The diet will be necessary until the symptoms are gone. Your veterinarian will then re-introduce foods back into your cat’s diet to identify which food is causing the allergy. Some cats, however, may require a permanent switch to prescription food, home-made food, or simply need avoid certain brands and types of food. Even if your cat doesn’t have food allergies, proper nutrition is very important for overall well-being as well as your cat’s skin. High protein foods with essential fatty acids and antioxidants are particularly helpful for keeping your cat’s skin healthy. Unique protein sources such as venison or duck and those that include fish oil, which naturally contains high levels of omega-3 and omega-6 fatty acids, are especially helpful. Vitamin E is also an excellent antioxidant that boosts your cat’s immune system. Every effort must be made to remove the allergens from the household if your cat is diagnosed with an allergy. Other steps include keeping your cat indoors, particularly during allergy season. Medication such as cortisone or steroids can help manage airborne allergies such as pollen. Antihistamines may be used but be aware that they work best as a preventative to pollen allergies and are not as useful after your cat has been exposed to the allergen. Regardless, all medications should be approved by your veterinarian. Never give your cat medication that is intended for dogs, humans or other animals without your veterinarian’s approval. There are many products to ease the symptoms of allergies including oatmeal sprays, aloe or other natural products to alleviate itchiness. Flea and tick prevention products are always recommended for cats. These are particularly helpful for outdoor cats and cats living in warm, humid climates where fleas are most common; or wooded areas where ticks reside. Remember fleas can be found year-round and are easily transmitted to cats from other animals. Your vet can advise which type of preventative product is best for your cat. Plus, they can provide instructions on how to rid your pet and household of fleas if your cat is found to have fleas. Besides allergies, cats can suffer from a variety of skin diseases. This includes feline acne, bacterial or yeast infections, ringworm and other fungal skin disease, alopecia or hair loss, and dry skin or dermatitis. Most conditions are not serious, but only your veterinarian can provide the proper diagnosis and remedy. While all cats love to groom, be aware of excessive itching, scratching, licking or rubbing. 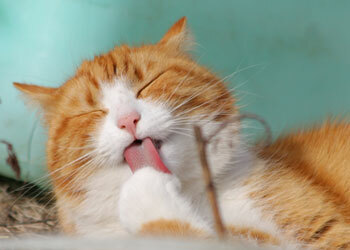 Grooming is a necessary and natural behavior for cats. Excessive grooming can be a symptom of an allergies, skin disease or stress. If you notice unusual obsessive grooming bring your cat in for a medical examination. Although rare, some researchers believe cats can be allergic to plastic and develop feline chin acne from drinking and eating from plastic bowls. Symptoms appear as small bumps on the cat’s chin. While feline acne may cause your cat to miss cat prom, it is not serious. Breakouts can be the result of stress, poor grooming, a reaction to medication or the result of a more serious skin condition. Feline acne occurs most frequently around the cat’s chin and will consist of bumps or pimples that may be either dry or with pus. Your veterinarian will recommend a specialized shampoo, gel or antibiotics as a cure. You can also switch to metal, ceramic or glass bowls if you suspect your cat has this rare condition. Bacterial skin infections may present in different ways, but symptoms include itchiness, red lesions, hair loss, open sores or circular lesions with peeling or scaly edges. One type of bacterial skin infection is Pyoderma which appears as ulcers or lesions. These can appear anywhere on the cat’s skin. Bacterial skin infections are treated with antibiotics but may be the result of other skin problems. Make sure your veterinarian is aware of all the symptoms to help prevent reoccurrence. Yeast infections are caused by a fungus and may appear as redness in the ear flap, excessive scratching of the ear and may include a black or yellow discharge. Treatment usually includes anti-fungal medication. Yeast infections are similar to bacterial infections in that they are often the result of an underlying medical condition, so your veterinarian may provide additional treatment. Another type of fungal skin disease is ringworm. Kittens under 12 months old are particularly susceptible. Ringworm appears as circular lesions most commonly on a cat’s head, ears or forelimbs. The surrounding skin will be flaky and there will be hair loss. Ringworm is highly contagious and easily spread to other animals as well as humans. Depending on the severity of the ringworm, treatment will include special shampoo, ointments or oral medication. Sporotrichosis caused by Sporothrix is a rare fungal skin infection that affects cats. It appears as small, hard skin lesions that may leak fluid. Lesions are most commonly found on the nose, ears and face of the cat, but can be found on other parts of the body. This disease is highly contagious to other animals and humans, and therefore is considered a public heath concern. While sporotrichosis is rare, it can be fatal. 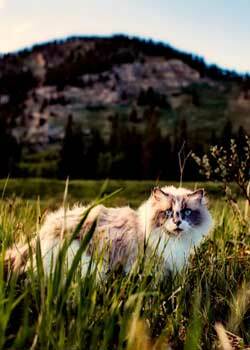 The disease is spread through direct contact with the infected lesions as well as from scratches or bites from an infected cat. You must seek medical attention from a veterinarian to ensure proper treatment and steps to avoid spreading this disease. Shedding or loss of hair is called alopecia and is a common problem for cats. Hair loss can be partial or complete. The skin, however, can still appear normal or have redness, rashes, bumps, scabs or skin loss. A blood test can determine whether the hair loss is due to a hormonal or thyroid imbalance. Additional tests are available for ruling out cancer or other medical conditions. Hair loss can be the result of many things including stress, and there are treatment options for some conditions, but some cases of alopecia do not have any treatment available. Cats may also develop dry, flaky skin or dermatitis. Like people, cats may experience dry skin in the winter but persistent dandruff may be the result of poor nutrition, inadequate grooming or a more serious medical condition. Dermatitis is usually the result of an allergic reaction to a grooming product, food or other irritant. Common symptoms are scratching of the head or neck, chewing on paws or base of the tail or scratching the ears. Treatment will often include products to soothe the irritated skin and a special shampoo or supplements to treat these conditions. Cats are naturally curious and enjoy investigating every square inch of your home. Unfortunately, that means your cat may be exposed to allergens that you don’t even know exist in your home or yard. Also, the primary symptom of allergies and skin disease is excessive grooming which may be difficult to notice since cats love to groom. Cat lovers, however, should regularly check the cat’s skin to make sure that it is smooth and soft with no redness. Be aware of bumps, pimples, lesions or loss of hair since these are all symptoms of skin disease and require a trip to your pet care professional. Luckily there are a variety of treatments available, but as with any medical condition, your pet needs to be properly examined and diagnosed. When it comes to your pet’s health, proper veterinarian care is the only way to “skin a cat”.